One night while I was tossing and turning, I had a delightful dream. I saw Ravi Shastri all decked up, in riding boots, sporting an equestrian hat, wielding a whip stick, getting ready to inspect his stable. He had quirky names for his ponies. I can distinctly recollect a�?Runs on the Boarda��, a�?Cool Customera��, a�?Tracer Bulleta�� and a�?Playing a Blindera��. a�?Slasheda�� and a�?Slashed Harda�� were a pair of twins. a�?Mixes It Up Nicelya�� was his idea of a cross breed. a�?Up In The Aira�� was his show jumper. I woke up in a sweat when I discovered that he had bet all his money on a�?Cricket Is The Winnera��. Jokes apart, race horse naming is serious business. The accent is always on a positive spin. 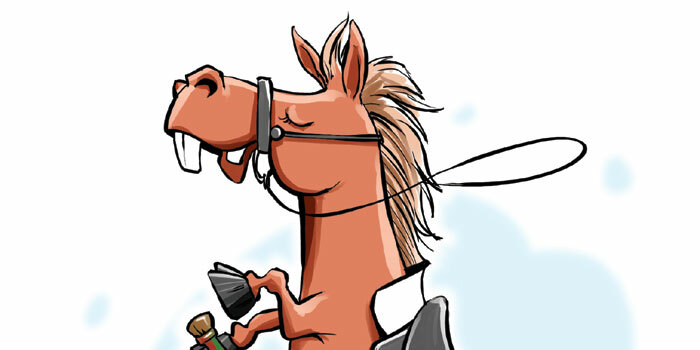 If you run your eye over the derby results, youa��re likely to find a a�?Chariot of Firea��, a�?Wings of Glorya��, a�?Velvet Blackjacka��, a�?Kings Ransoma��, a�?Thunder Bolta��, a�?Faster Than Lighta�� or a�?Cowboya��s Delighta�� somewhere. Things are a little warped sometimes. The owner tries his hand at having a wee bit of fun by opting for the unusual. A loser steed is self-deprecatingly labelled as a�?Blue Moona��, a�?Another Chancea��, a�?Will Run For Fooda�� or a�?All Over Da Placea�� as the case may be. Nods to movies happen every once in a while. a�?A Horse Called Mana�� is a twisted take on the 70s flick A Man Called Horse. a�?Beam me up, Scottiea�� is a hat tip to the legendary catchphrase that was never uttered in Star Trek. a�?Blonde in a Motela�� (who incidentally was sired by a�?Bates Motela��) is a reference to Psycho. Brands get a liberal plug, too, from doting admirers. Bacardi, Starbucks, Campari, Victoriaa��s Secret and Jack Daniels are regulars at many circuits. Note the marked preference for spirits. Maybe thata��s why a tippler named his horse a�?Sotally Tobera��! A few thoroughbreds get their kicks by flirting with profanity. a�?Hoof Hearteda�� is everyonea��s favourite. Say it aloud and youa��ll discover it sounds ingeniously like a�?Who Farteda��. Repeat the same with a�?Sofa Can Fasta�� and youa��ll know why the prancer was nearly blacklisted. The one I tripped on the most was the almost Groucho Marxy a�?Dewey Cheatum & Howea��. When the announcer utters it, it feels as if hea��s bragging on the microphone saying: a�?Do we cheat them and how?a�? Now thata��s what I call a racy name.